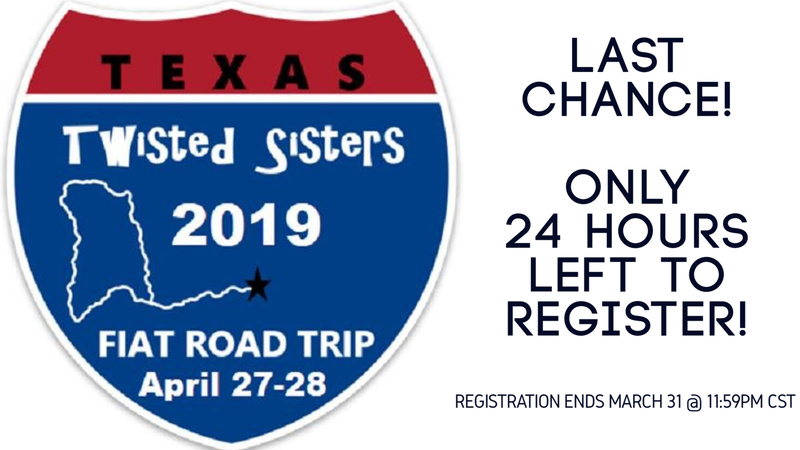 5th Annual Texas Twisted Sisters Fiat Road Trip: April 27-28, 2019! 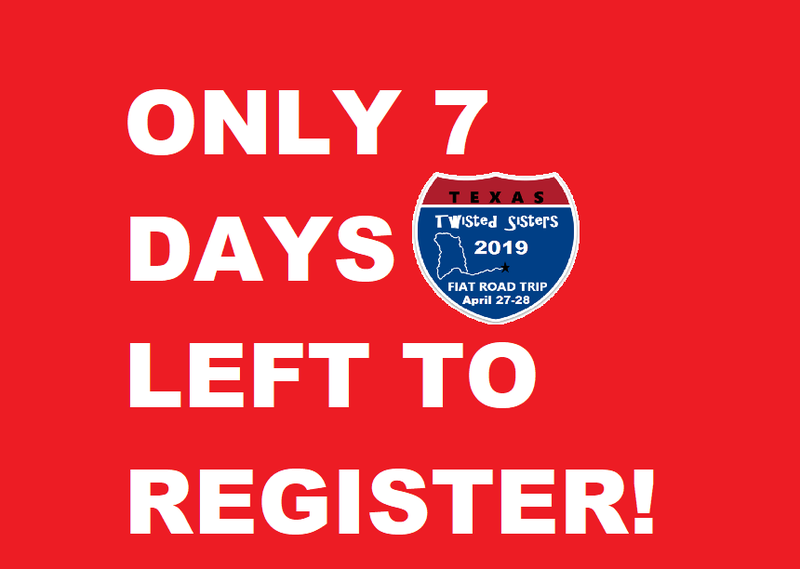 Our 5th Annual Texas Twisted Sisters 2019 is around the corner! (April 27-28, 2019) Registration for this event will close March 31, 2019! Get registered for this event today!!!! CO-SPONSORS AND PRIZE GIVEAWAYS ARE NOW POSTED! REGISTRATION WILL BE CLOSING IN 7 DAYS FOR THE 5TH ANNUAL TEXAS TWISTED SISTERS!! You have until March.31, 2019 at midnight to get signed up! We will not be offering late registration. If you have not signed up and want to attend...head over to our website now to register!! We are so excited that Twisted Sisters is entering its 5th year! This event would not be what it is without all of our drivers/guests. We appreciate all of the support we have received from the Fiat community as well as the incredible raffle prizes so generously donated by our co-sponsors. - 40 will be attending the Saturday night group dinner. We have 10 co-sponsors making this event even more awesome!! LAST CHANCE TO REGISTER! Registration ends tomorrow at 11:59pm CST! There will be no late registration this year. You don’t want to miss this event! If you can go, you need to SIGN UP NOW! Please share this post so everyone knows. Registration is now closed. Thank you to everyone who is participating. We will post final attendance numbers later today.